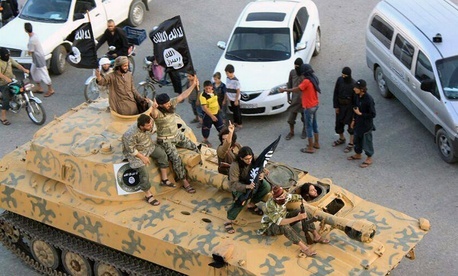 The Islamic State makes about $1 million a day from sales of oil it has seized at war. It has generated $20 million this year alone in ransom. And it has taken untold sums of additional cash at gunpoint in the Syrian and Iraqi towns it controls, and through donations it solicits from sympathizers through social media. Those are all assessments of the Treasury Department, which is highlighting its expanded efforts to cut off ISIS's funding as part of the broader war against the terrorist group. As explained by David Cohen, the department's undersecretary for terrorism and financial intelligence, the targeting of ISIS's money stream is both harder and easier than similar efforts against al-Qaeda. Cohen's detailed account of the department's findings come as the U.S.-led military campaign against ISIS continues, and he said there were indications that ongoing airstrikes in Iraq and Syria have begun to "hamper its ability" to generate revenue from oil smuggling. As administration officials have previously acknowledged, the Islamic State is the wealthiest terrorist group it has confronted. That is principally because unlike the syndicate run for years by Osama Bin Laden, it has not operated in the shadows but has seized wide swaths of land, taking control of oil fields, plundered local towns and villages. "Unlike, for instance, core al-Qaeda, ISIL derives a relatively small share of its funds from deep-pocket donors and thus does not depend principally on moving money across international borders," Cohen said in prepared remarks to the Carnegie Foundation for International Peace in Washington. "Instead, ISIL obtains the vast majority of its revenues through local criminal and terrorist activities." The millions ISIS gets in ransom from its kidnappings have figured significantly in the debate over the U.S. policy not to pay for the release of hostages, which raged after the series of videotaped beheadings the terrorists have conducted. ISIS also gets funding through online donations, relying on social media networks in a way that officials acknowledge is difficult to intercept. The administration has stepped up its efforts to crack down on terrorist smuggling through sanctions, but as Cohen pointed out in his speech, it cannot hope to stop the flow of money with sanctions and terrorist designation, only to "frustrate ISIL's ability to attract money and fighters." At the same time, the Islamic State's territorial ambitions "are a financial burden," Cohen argued. As he told reporters at the White House, ISIS terrorists "act as if they're a real state." The group must spend money to import foreign fighters, and it is trying to provide basic government services, like electricity and water, in the territory it controls. "That is expensive," Cohen said at the White House. "It makes their efforts more difficult." While the millions ISIS is amassing is impressive, it is a paltry amount compared to the $2 billion that the Iraqi was spending annually in the provinces where the terrorists are now operating. He noted reports of shortages in ISIS-controlled areas of Mosul, and he said the U.S. would try to exploit the vulnerabilities. Essentially, the U.S. is betting that ISIS won't be able to keep its fiscal house in order any better than many other nations, and it presumably won't have foreign governments at the ready to bail it out of debt. "We should not confuse funding with financial strength," Cohen said. "While ISIL today is well-funded, a terrorist group’s overall financial strength turns not just on its income, but also on its expenses and, importantly, the degree to which it can dedicate its resources to violent purposes." And while ISIS may despise the American way of life, it does not appear to hold similar views about our form of money. For the most part, it has access to Iraqi dinars. But at the White House, Cohen was asked what currency ISIS preferred. "I assume the preferred currency of ISIL," Cohen replied, "like the preferred currency of everyone around the world, is the U.S. dollar."